While there’s no “right” age for a facelift, women age 50 and above tend to consider facial plastic surgery more often than those who are younger. Several things often align to cause aging adults to move forward with the life-changing procedure. It may elicit both a laugh and a cry. If that’s the case, it’s probably time to start considering a more permanent solution, according to Dr. Brent J. Smith who has treated thousands of women over the course of his career in Denver. 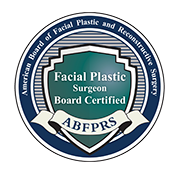 Not surprisingly, the most common age for a facelift is around 58 or 59, with that age increasingly skewing younger. For women, the 50s can be an especially tricky time of life. With so many changes underway related to dropping estrogen levels and menopause, it’s hard to know what each new day will bring. And emotional and physical changes seem to speed up during this time. In fact, at Smith Cosmetic Surgery, we often hear the phrase, “I feel like I aged overnight.” This, too, can be an impetus for finding a more long-term solution to the sometimes sudden and startling effects of aging. Middle-aged women may also start to notice friends who are having successful plastic surgery work. Seeing others’ natural results can be an inspiration. And sometimes discussing the plastic surgery process, expectations, and results with a close confidant can give you a confidence boost to move forward with a facelift as well. Additionally, women who marry later or have postponed having children until later in life may experience emotional issues around aging each day at their children’s schools. Being a 50-year-old mother around other mothers of elementary-age children could mean confronting a youthful 27-year-old mom daily. And that can be a challenging reminder of age—and also an incentive for a facelift. Finally, middle age can be a time when working professionals have reached the height of their careers and may finally have strong earning potential. Kids may be out of college. Retirement is on the horizon. And finances may have grown or stabilized. It may be the first time that it feels acceptable to spend some discretionary income on self-care. And a facelift may become an investment in the second half of life. Whatever causes a patient to choose Smith Cosmetic Surgery for a facelift or other facial plastic surgery procedure, we are always happy to welcome new patients at younger ages. 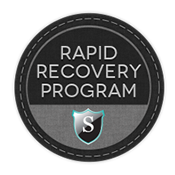 The reason is simple: Younger bodies recover faster and retain a more youthful look after surgical enhancement. If someone comes in at age 60 or 70, that’s an additional decade of sun, toxins, and depleted collagen that Dr. Smith must erase on the face. It’s natural, but there are a greater number of physical setbacks that come with the aging process. And that means there are greater challenges to facial plastic surgery. That said, as an exclusive expert in plastic surgery on the face, Dr. Smith has nearly three decades of performing facelifts on people of all ages. In fact, he enjoys the challenge of operating on even the most senior patients. It’s all part of his craft—and art. But it’s a fact that surgery is simply easier at a younger age. With the facelift in particular, the more healthy fat, collagen, and muscle Dr. Smith has to work with the better. While all facial plastic surgery addresses the underlying structure of the face, it’s helpful to have more tone to work with in the first place. For example, as young as 35, humans begin to lose important fat deposits in the face, which can leave the underlying muscle prone to aging through gravity. 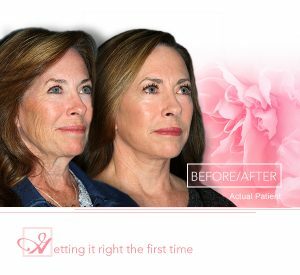 Dr. Smith manipulates the musculature underneath the skin’s surface with each and every facelift. And that becomes a tougher prospect the older you are. Heavily aged skin doesn’t have the support structure to “bounce back” as quickly from any form of trauma, whether that’s an accident or a planned procedure. The good news is 50 is an ideal time to stop nature in its tracks and not lose another day of youth. And women have more options than ever before with the modern-day mini facelift. But it’s critical to make sure you get it right the first time. 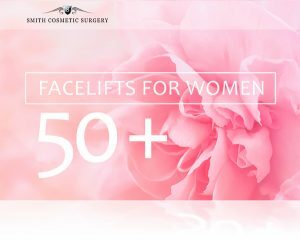 Smith Cosmetic Surgery patients consistently look 10 to 15 years younger following Dr. Smith’s signature natural-looking facelift. 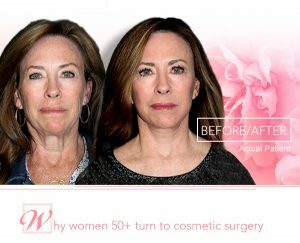 A properly done facelift in the 50s, followed by a state-of-the-art healing formula like Smith Cosmetic Surgery’s Rapid Recovery, will extend the results of your facelift. You will be able to get touch-ups as you deem necessary throughout the natural aging process. But your first facelift at Smith Cosmetic Surgery can truly be your one and only. Unfortunately many people aren’t educated about the amazing long-term results a natural-looking facelift can produce. Advertising often tricks us into thinking that the latest quick fix could hold the answer. Women are especially targeted by the marketing of procedures and products touted to take away wrinkles or lift a sagging neck and jaw line in an instant. “Far too often women come to us after they have exhausted their options trying what they saw on an infomercial or TV commercial and spent their budget on these procedures,” explains Dr. Smith. But, remember, we know this happens all the time. And we promise, there’s no judgment at Smith Cosmetic Surgery. We are here to give you the cosmetic surgery solution you’ve dreamed of. Ready to see what that looks like? Give us a call today at 888-218-4479 or contact us online to schedule your complimentary consultation and digital imaging of the new you.